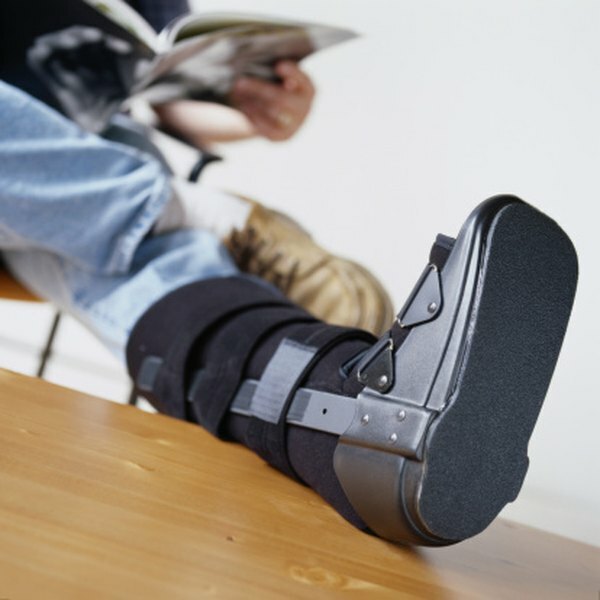 Walking boots are plastic, removal casts that can be used to protect your foot, ankle and lower leg as you recovery from an injury -- such as a fracture or sprain -- or from orthopedic surgery. Walking boots are often black or gray in color and are relatively bulky in comparison to a normal shoe. If you don't want to draw any unnecessary attention to your injury, have to explain how you became injured or are just self-conscious, there are actions you can take to disguise your walking boot. Wear loose-fitting pants. Wear pants that are lose enough to fit your walking boot underneath your pants opposed to tucking your jeans or pants into your walking boot. Opt for sweat pants or loose-fitting dress pants. Place a shoe on your other foot that is the same color as your walking boot. If you have a black walking boot, wear a black shoe on your other foot. Wear a shoe with a small heel. Avoid wearing sandals or shoes with virtually no heel. The sole of a walking boot is often a couple inches tall. Wearing a shoe with a heel may prevent you from limping and can also prevent hip and lower back pain from walking uneven. For your safety, avoid this step if you are required to use crutches with your walking boot. Match your socks to your boot. If your boot is gray, wear gray socks. Avoid flashy or bright colored socks that may draw attention to your feet.